•Members of the REYC only. •Yacht restricted to Solent (no further west than Hirst Castle, no further East than Chichester). •crew manning to be Day Skipper plus one other capable adult. •There will be a mandatory brief on sail plans and differences with this boat. Skippers are to allow two hours for full hand over and brief - there will be no out Of hours blind hand-overs for skippers who have not previously sailed Hebe. N.b. Due to her design Hebe is not currently MCA coded pending design clarification. 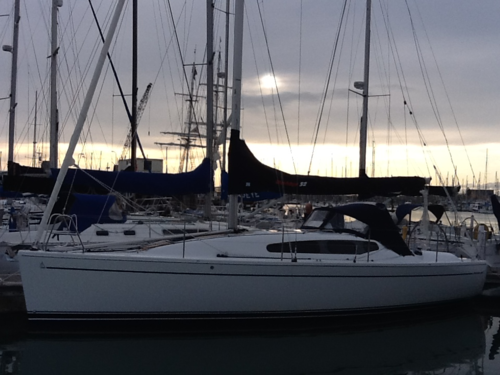 Ideal for Unit AT, offshore racing or family cruising. Ideal for Unit AT, Coastal cruising and racing, family charters. A list of charges made for yacht usage can be found on the yacht charter page of the REYC Website. The J109 is a pedigree offshore racer that is equally at home being used for Adventurous Training or family cruising. Trojan is spacious, fast and robust - an ideal boat for an extended trip or a blast around the cans. MCA Coding in progress (Nov 15). N.b. Skippers wishing to race Trojan or to cruise with the asymmetric spinnakers issued should arrange for specific briefing/training prior to any charter.